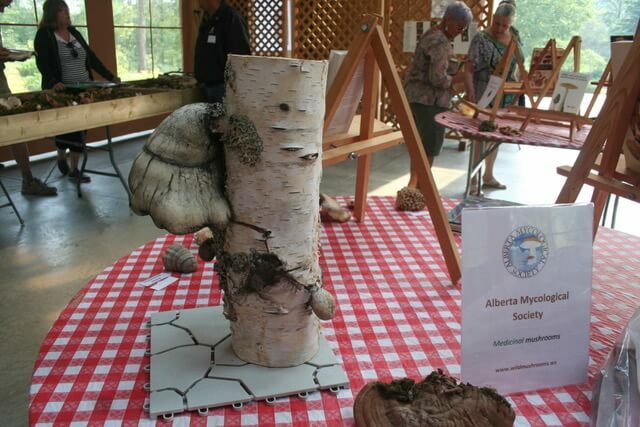 On Sunday, August 19, 2018, the University Garden attracted more than 1500 visitors, many of whom also found their way to the Pine Pavillion where the AMS proudly showcased their annual Mushroom Expo. Some visitor comments included “Amazing”, “Delicious”, “Loved it”, ”We learned a lot”, “Thank you” and even, “The best Mushroom Expo in North America”! Why and what makes this event so awesome and popular? 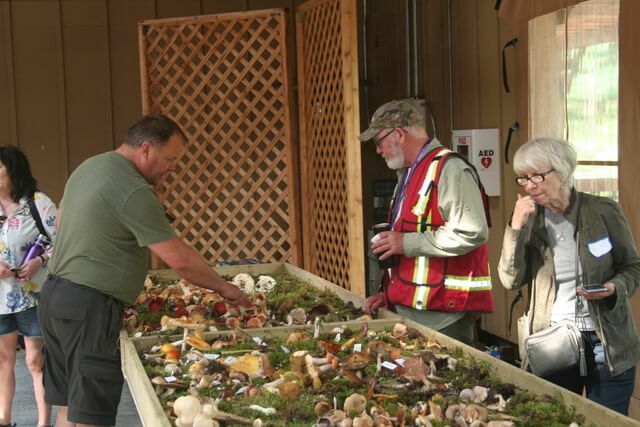 Visitors are often amazed at the large numbers and varieties of wild mushrooms foraged and displayed at the Expo. Boletes, russulas, polypores, puffballs, earthstars, corals…so many colors, shapes and sizes. 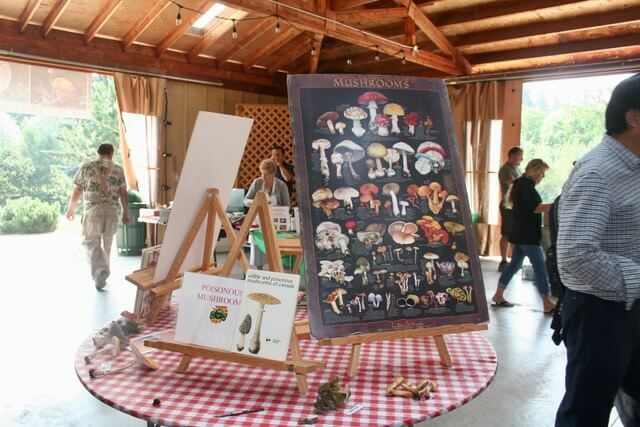 Visitors also learn which mushrooms are edible, medicinal, or poisonous thanks to, not only our informative displays and posters, but also to the volunteer experts at the mushroom display table. 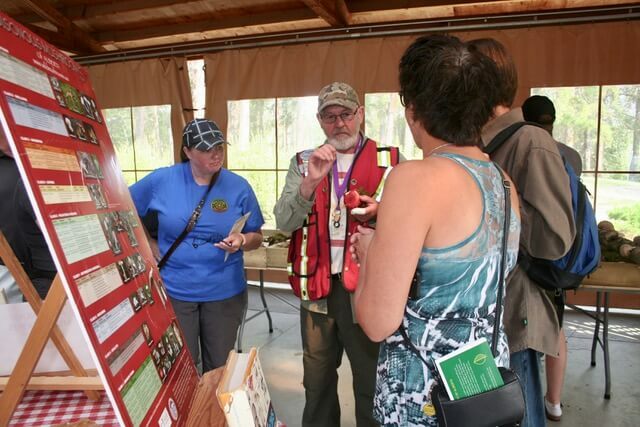 The volunteers loved sharing knowledge, dispelling myths and misinformation, and enlightening the public on the value of the fungi kingdom to the world. Visitors signed up to go on brief walks through the Botanic garden in search of mushrooms that were currently growing. When you really started to look carefully around the Garden, mushrooms could be found growing on trees, in grass, in soil and even along the pathways. Thanks to Robert Simpson, the morning guide, and Bill Richards, the afternoon guide, visitors’ questions were answered about the mushrooms they found while walking through the Garden. Always nice to learn something new about the fungi you find growing in the outdoors. A lecture and discussion on ‘Medicinal Mushrooms’, by Kevan Rurak. A presentation for children (young or old) on ‘Fun Mushroom Facts for Kids’, by Rosemarie O’Bertos. A basic primer of knowledge and information on ‘The Wonderful World of Mushrooms’, by Rob Simpson. mushroom club memberships, fresh mushrooms…and even some ‘sales’ items. This year, we had new charcoal heather grey AMS ‘Mushroom Hunter’ logo t-shirts for sale. Candice Cullum, our regional representative from the Central Alberta Region, developed the unique design for our new t-shirts. Sales were also swift for Mycologs which are living mycelia encased in 3’ x 1’ bags. Anyone who purchased one of these could then grow a number of flushes of e.g. oyster mushrooms in their yard. These were provided by Carleton Gruger of ‘Gruger Family Fungi’, a local hemp based vertical mushroom farm in Nisku, Alberta. Please click here if you’d like more information about Gruger Family Fungi! 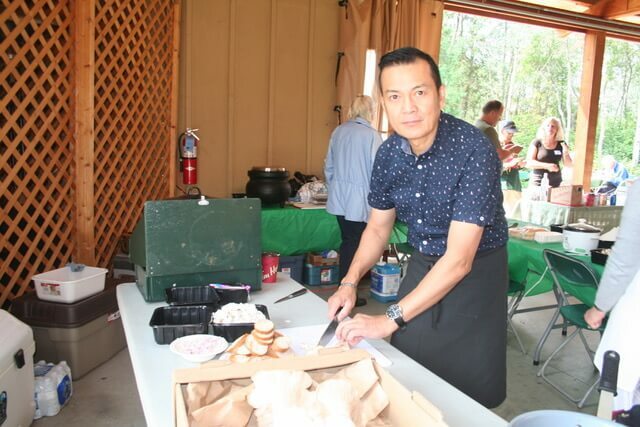 Fresh chanterelle mushrooms were also sold and provided by Mona foods of Edmonton. Due to a shortage of chanterelles in Saskatchewan, this year’s crop had to be flown in from Europe…not very local wild mushrooms, but still very tasty. mushrooms’ for the public to try. We were able to procure giant King Oyster mushrooms from the Gruger family which our chef then proceeded to fry with butter, shallots, Marsala wine and cream and serve on slices of baguette. A gastronomic delight! famous homemade Cream of Mushroom Soup which was served with Porcini crackers. A big seller and truly delicious! The Cafe is always a busy place and our volunteer, Louise Puk was able to make sure that the area was smoothly and efficiently run. 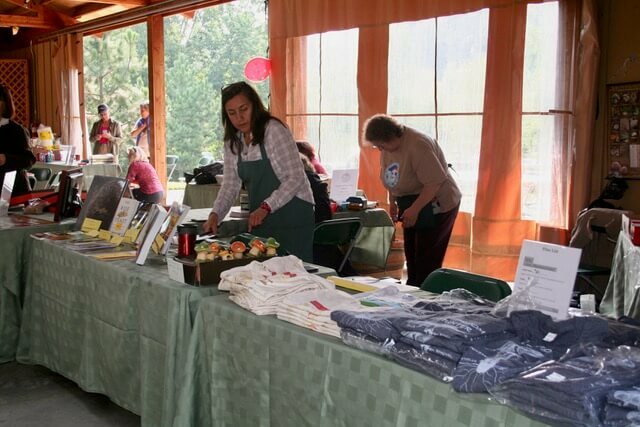 In conclusion, so many volunteers participated in this Expo. A big ‘Thank You’ goes out to everyone that helped to make this a great event. It could not be done without everyone’s help. Sorry if we missed any volunteers in our ‘Thank You’ list, but thanks to all who participated! If you have any ideas for next year’s event, please Contact Us!